Twenty minutes after his Drexel University men’s basketball team lost by 13 points to the school’s biggest rival, the University of Delaware, head coach James “Bruiser” Flint entered the postgame press conference with a smile on his face. A trademark Flint postloss press conference is contemptuous and ireful — he’s not a fan of losing. On Jan. 20 the room wasn’t rank with joy, but coming into the room with no prior knowledge, you would have been hard-pressed to guess Flint and his coaching staff expected anything other than a loss at the hands of the Blue Hens. Flint is officially taking the smart approach to the men’s basketball season. And that’s okay, because the Dragons should have lost that night’s game. “They’re one of the best-scoring teams in the country,” Flint pointed out after the 90-77 loss. Delaware shot from the field with 56.5 percent accuracy, scoring more than 40 points in each half and seeing five players hit double digits. Facing an offensive juggernaut like the Blue Hens is always difficult. Doing it at reduced health is even more so. Sophomore guard Tavon Allen returned from a sprained ankle and, while his 19 points were the second-highest total on the team, it was clear that he was not fully recovered from his injury. Flint acknowledged this much as well, but said he was proud of what Allen did on the floor. When one of your guards can’t defend as he should, you will be scored on. When you’re facing the most potent scoring team in your conference, you will be scored on early and often. Delaware senior guard Devon Saddler went for 23 points on 14 field goal attempts, dictating the flow of the game and bullying Drexel’s defenders, Allen among them. The Dragons also played Monday night’s contest without junior forward Kazembe Abif, out with a knee sprain for the fifth consecutive game. With Abif out and senior forward Dartaye Ruffin still regaining his footing after missing two games last week, the Dragons’ paint presence was lacking. They were outrebounded 44-27, a brutal disparity that led to 14 second-chance points for the Blue Hens, compared to just three for Drexel. After starting the second half on a 7-0 run to cut Delaware’s lead to single digits, the Dragons couldn’t keep their opponents within reach; rebounding was a key factor. And that’s okay. Actually, all of Jan. 20’s shortcomings are okay. Flint would never admit that it’s okay for his team to be outrebounded. He probably can’t stand that his defense was torched for 90 points, and he definitely can’t appreciate losing to Drexel’s biggest rival. But getting worked up over this game would do nothing but harm this Dragons team. The correct plan of action for the Dragons — at this point — is to simply take the losses with a grain of salt and refocus on getting their injured players healthy. After this game, the team stands 10-8 overall with a 2-3 Colonial Athletic Association record. With eight losses and no quality wins, Drexel’s candidacy for an at-large bid into the NCAA Tournament is five losses in the rearview mirror. The only way for the Dragons to reach the NCAA Tournament and go dancing in mid-March is to win the CAA tournament beginning March 7. By winning the conference tournament, the team would get an automatic bid into the Big Dance. Last season’s CAA tournament champions, James Madison University, played a very similar card perfectly. For a two-week stretch at the end of January and beginning of February, the Dukes floated just above a .500 win-loss ratio — just where Drexel’s 10-8 record puts them today. But they finished the regular season strong with an end-of-season record of 17-14, saw a number of players — A.J. Davis and Rayshawn Goins in particular — start to heat up, and won the conference tournament in a whirlwind of momentum. They even won an NCAA Tournament game, albeit a play-in game. 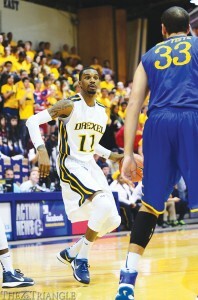 And the Dukes didn’t have near the same amount of talent on their team as this year’s Drexel squad does. If Flint and the Dragons play the next few weeks like they know they should, Drexel’s season is very far from over. Abif should continue to take his time in coming back from his knee sprain. Allen should ease up on forcing himself into meaningless regular-season games where all he stands to do is further injure his ankle. At this point, patience is the ultimate virtue for the Dragons. Play hard over the final 12 games of the regular season? Of course. Flint wouldn’t have it any other way. But also remember to play smart. The real season begins March 7 in Baltimore, Md.